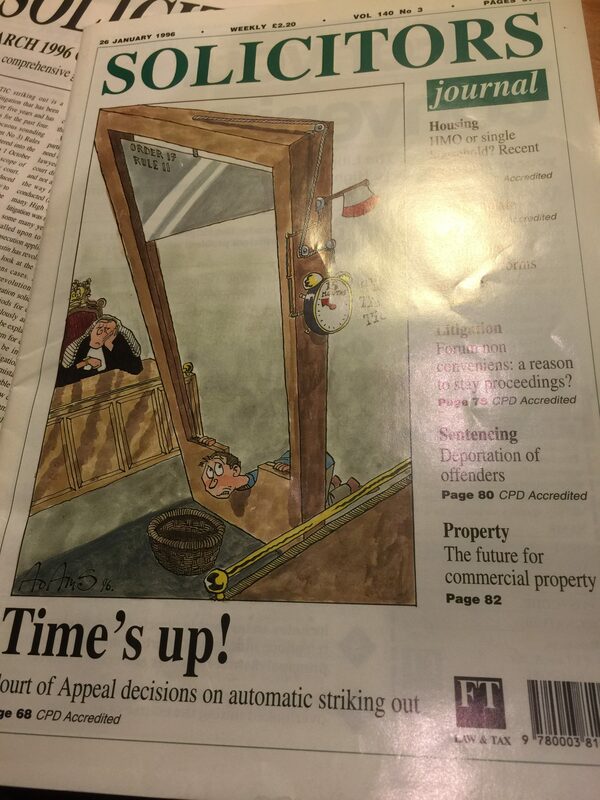 The Solicitors Journal has published its last edition after 160 years. I was a SJ columnist for around 10% of that time. It brings back some memories. 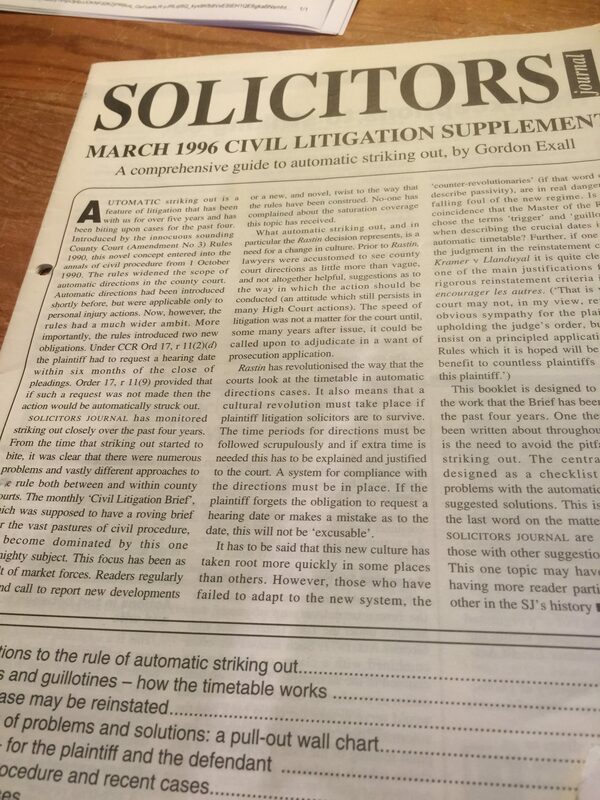 I am often surprised by how few of the readers of this blog appreciate that it started as a column on the Solicitors Journal.It started with a phone call (this was in the days before email). The then editor, Marie Staunton, had published several articles I had written on civil procedure. She asked did I want to write a monthly column on civil procedure? I did. I then had to come up with a title. “How about Civil Litigation Brief?” I asked. So for 17 years, or so, I faced the task of writing two pages a month on civil procedure. In the days before the internet I used to write the column over the weekend it was due and then post a floppy disk to the SJ. It had to be there on the following Monday and I became a master at knowing those post boxes in Yorkshire that collected on a Sunday. (The nearest one in those days was central Leeds – 30 miles from where I lived. Often I would make a family trip of it, taking the kids to Leeds). Life got easier as the ability to email copy came in. The kids got to stay at home. There were two large elements of the Civil Litigation Brief when at the SJ. The constant commentary on the rules relating to “automatic striking out”. The series I wrote about the “new” Civil Procedure Rules. Automatic striking out became a feature of CLB for almost a decade. CPR Ord 17.r.11(9) remains implanted in my mind as the lower courts and the Court of Appeal struggled with the thousands of cases that this simple rule brought about. It led to a judgment from Judge Haggue QC. The consternation caused by automatic striking out is difficult to convey to those who weren’t there. Suffice to say that once the Court of Appeal clarified matters (after about five attempts)I got to write a guide to the whole topic. It is often interesting to look back at what was happening in civil procedure decades ago. 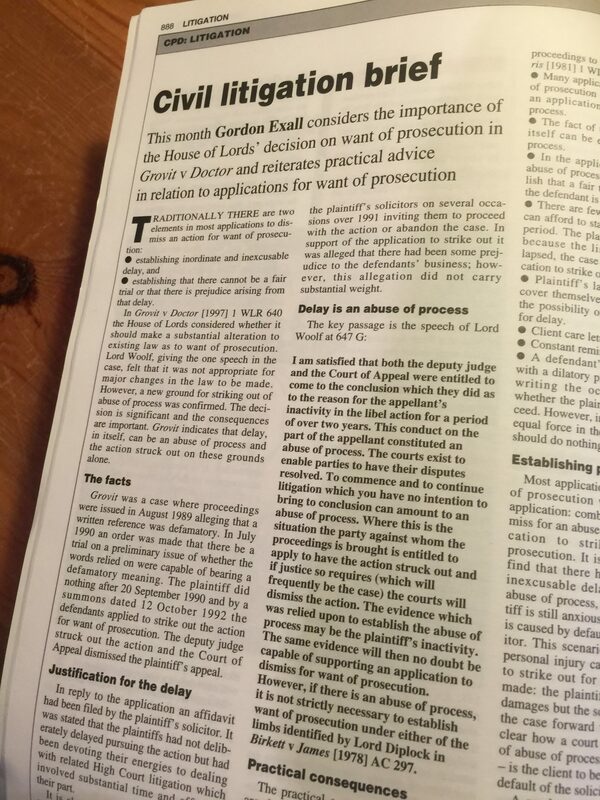 In September 1997 I was writing about recent decision of the House of Lords on striking out for want of prosecution (an area of law that has almost disappeared thanks to case management). When the Woolf reforms came along CLB went weekly (imagine writing about civil litigation every week). There was little guidance on the rules and I worked through each in turn. This process wasn’t helped by some ambiguity in the early rules and the rules being amended (for instance to allow judgment in default on a counterclaim). There never was a Solicitors Journal office (not in my day anyway). The reality was a few computer terminals for the editor, deputy editor and others on one floor in a publisher’s office in Lambs Conduit Street. At that stage it was owned by FT Law & Tax and then moved on to Sweet & Maxwell. 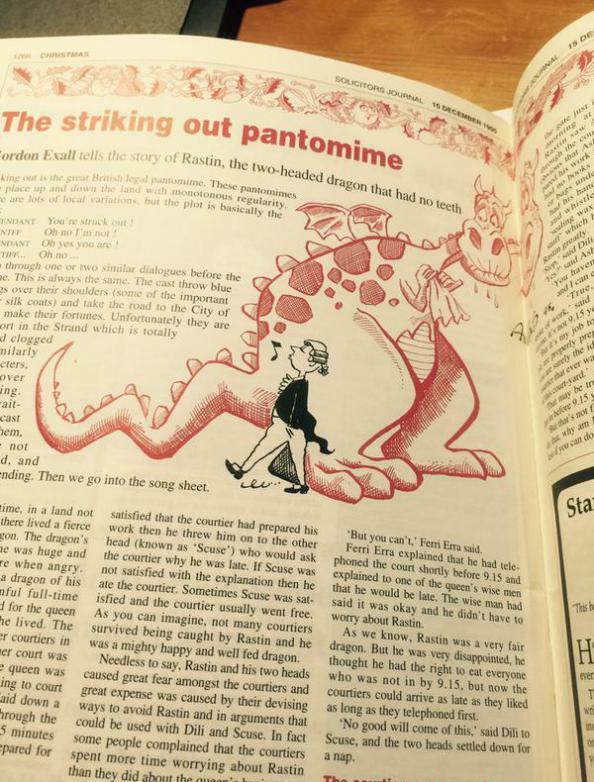 I haven’t seen them for many years but a very tight ship was ran by Marie Staunton, Sue Hart (who went on to be editor for many years) and Judge Hodgson (the commissioning editor). I certainly miss the sub-editing help I received over those years. I really do miss the cartoonists that use to illustrate the text brilliantly. THE REASON FOR ITS DEMISE? The galling part is that the SJ had done nothing wrong. It innovated, it went online, it recently introduced an app. It had first class contributors and journalists. However, I suspect, despite all this it could not make a living. Advertising and subscriptions were not enough. It had been for sale since the start of the year and there were no buyers. Like a lot of journals and magazines it has probably been killed off by the internet. Legal information is now more immediate and, for many people, Google has become the legal research engine of choice. Richard Barr, in his “obituary” remembers that when he started practice. Nowadays updates are done online. Webcasts, blogs and daily updates are commonplace. Solicitors are more specialist and are likely to look to their own specialist journals for law than one that, perforce, had to cover the entire legal profession. Richard Barr had the difficult task of providing an input of humour into legal practice. A selection of his work will shortly be printed in a book. The Deputy Editor John van der Luit-Drummond provides a eulogy for the whole of the 160 year history. Michael Cross explains how the SJ kept the Law Society Gazette on its toes in So farewell then, SJ. * The first words written in the SJ 3rd January 1857. Gordon I have kept all my articles in SJ. If you would be interested, I can send you pdfs of the three or four that specifically name you! That’s a shame, it was a good magazine. Once again I feel that guilty sense of conflict, as I do when I see a bookshop close. I like the idea of magazines and newspapers and I like the idea of bookshops. But in practice I now get most of my news online free of charge and I buy my books from Amazon. One would imagine that saving money on such items would bring a feeling of pleasure, but it really doesn’t.